CES 2016 highlights - Day 4: Arcam, Moon, Harman Kardon and MQA | What Hi-Fi? After three action-packed days you'd think the pace at CES 2016 would be slowing down, but day four proved that just isn't the case. There were new product launches from Arcam, including the full debut of the SR250 stereo AV receiver, as well as an integrated amplifier from Moon. And don't forget to stay tuned to What Hi-Fi? on Thursday 8th January, with our Stars of CES being revealed at 3pm PST (11pm UK-time). 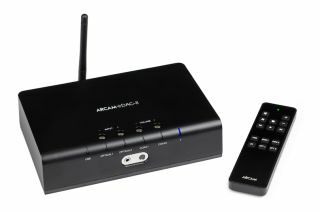 Some big news from Arcam at this year's CES included the launch of the second generation irDAC. The model features new internal circuitry and headphone amplifier output, aptX Bluetooth support and a new ESS SABRE DAC. Also on the Arcam stand was the SR250 stereo AV receiver that combines the performance of a stereo amplifier with the connections of an AV receiver. It's just gone on sale in the UK for £2500. Moon had a new addition to its Neo range of components at CES 2016 in the form of the ACE integrated amplifier. It combines an integrated amp with high-resolution streamer and DAC that lets you play from a variety of sources. Audio-Technica unveiled three new pairs of headphones in Las Vegas: the ATH-SR5 on-ears and their Bluetooth counterpart, the ATH-SR5BT. They were launched alongside a new pair of noise-cancelling headphones, the ATH-MSR7NC which come with new omni-directional noise-cancelling technology that claims to have no effect on sound quality. Harman Kardon brought its updated range of Omni multi-room speakers to CES. The new Omni+ range offers more speakers than before and hi-res audio support. Several speakers can also be connected together to create a 2.1 or 5.1 surround sound system. MQA has received a lot of attention at CES so far, but 7digital has given us the news we really wanted to hear. The music provider has announced it will be the first to offer MQA music to consumers and says it already has files from indie labels ready on its web store and mobile apps.